Biz.One Conference turn-key booth program is an effective and all-inclusive marketing platform that is designed to help you spend less money and creates an even playing field for all partners. 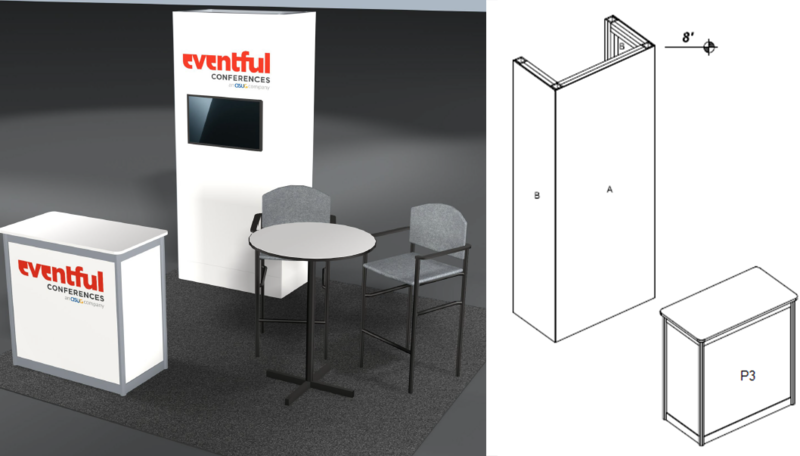 There are some graphic customizations that can be done to personalize your booth and this page will give you all the information that you will need to make your best showing. If you do not have a designer to create your artwork, you may use our graphic design company, Purpaula Productions. Please see the pricing information below. If you decide to work with Purpaula Productions, please inform them by Monday, August 20th, so she has enough time to create your artwork. Booth artwork must be submitted by Friday, September 7th, 2018. Any artwork not submitted by this date will be subject to a $250 late fee. FRONT COUNTER (P3) — Dimensions: 898mm (H) x 968mm (W).